Floette White in game: 622 Who? Important notice! Pokemon Floette White is a fictional character of humans. Floette (Japanese: ????? Flaette) is a Fairy-type Pokémon introduced in Generation VI. It evolves from Flabébé starting at level 19 and evolves into Florges when exposed to a Shiny Stone. 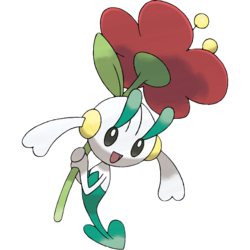 Floette has a white body and a green tail, shaped like a spade, and green eyebrows. 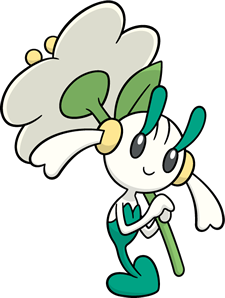 Floette also holds a flower, which can be red, yellow, orange, blue, or white, depending on its pre-evolution's. Its ears are white with yellow behind them. It flutters around and cares for flowers that are about to wilt; if the flowers of a well-tended flower bed bloom, Floette celebrates with an elegant dance. It is a female-only species with no male counterpart. 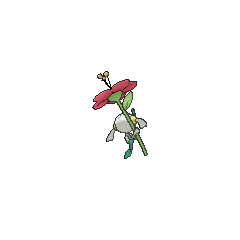 The Eternal Flower Floette, the Floette that befriended AZ, is different from a normal Floette. Its tail and eyebrows are blue. The yellow part of the ears is red. Its flower is different as well, with six petals instead of five, three which are big and three which are small. The stem is red, there are no leaves below the flower, and the part on the top of the flower is a black cone shape. The flower's underside is black, and the three big petals have a pattern of red and black. 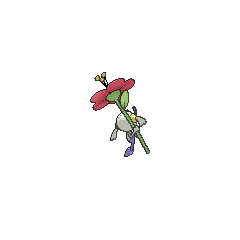 The Eternal Flower Floette is the only known Pokémon capable of knowing Light of Ruin. A Blue Flower Floette made her TV debut in Defending the Homeland!. She reappeared in Beyond the Rainbow!, Master Class is in Session!, and Performing a Pathway to the Future!, Facing the Needs of the Many!, and Till We Compete Again!. Multiple Orange, Red, Blue and Yellow Flower Floette appeared in A Windswept Encounter!, with the Yellow Flower Floette making its debut in the episode. Multiple Red Flower and Yellow Flower Floette made their debut in the opening of Diancie and the Cocoon of Destruction. A Yellow Flower Floette appeared in a picture in Battling Into the Hall of Fame!. AZ's Floette appeared in The Redemption. She was initially seen in a flashback of the great war of Kalos, being sent into battle and eventually dying, leading AZ to create the ultimate weapon with which to revive her. It worked, but after using the weapon to destroy both sides of the army and bring the war to an end, Floette realised how many lives were taken for hers, and left him. She finally returned to him after AZ's battle with Calem in Lumiose City. 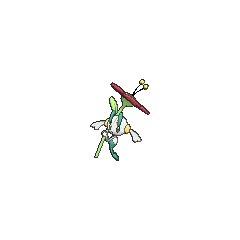 AZ's Eternal Flower Floette appeared in a flashback as he told the story about the Ultimate weapon, and how he used it to revive her in Flabébé Blooms, of the X & Y chapter. 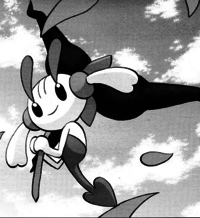 Trevor's Flabébé evolved into a Floette after defeating Aliana's Diggersby at Pokémon Village. Because only Blue Flower, Red Flower, and Yellow Flower Floette can be found in the Friend Safari, only these forms of Floette can have their Hidden Ability Symbiosis. Floette and Flaette may be a combination of flower and floret.